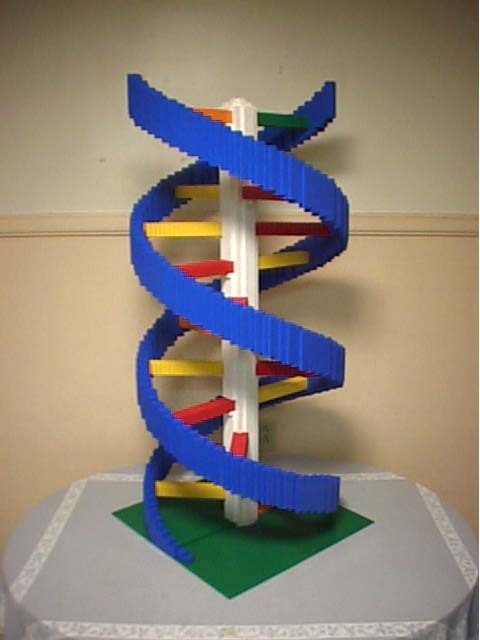 Here is what is probably my most 'geometric model' to date: a large model of a DNA double helix. This is one of several helices I have been commissioned to build for a particular client. The first few curves were novel, but then the repitition set in. 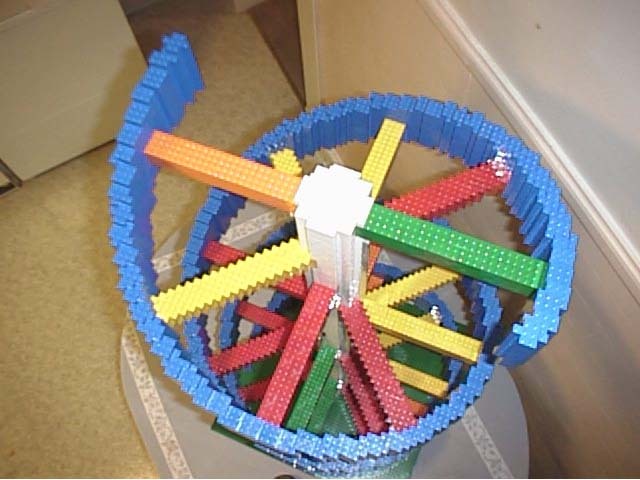 The helix has a diameter of 64 LEGO bricks. It is almost four feet tall. The 'blue ribbons' are 3 bricks thick, roughly. The white central column should technically not be a part of the model, of course, but it was necessary for structural integrity. This model is glued together, and, in fact, it is the first model I have built which pretty much requires glue in order to stay together. 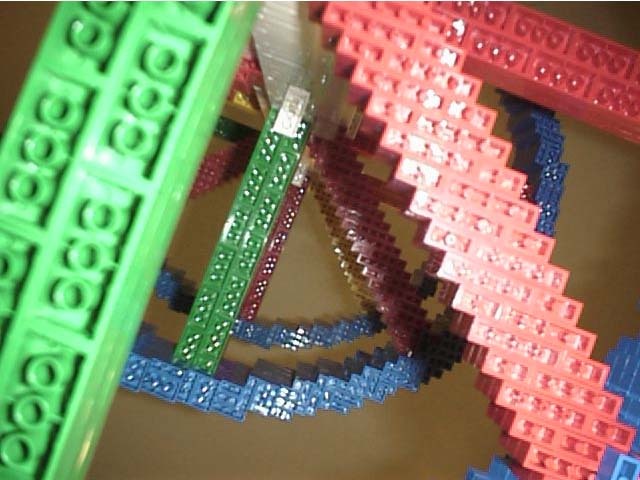 Six colors were used: blue for the ribbons, white for the central column, and then the 'crossbars' were constructed out of yellow, green, red, and orange (yes, I used LEGO-rare orange in this). Now, for the fun part... I get to build another one! Woohoo... er... ugh. The Double Helix sits atop my ktichen table. Looking down through the coils. Myself standing next to it (to get a sense of scale). 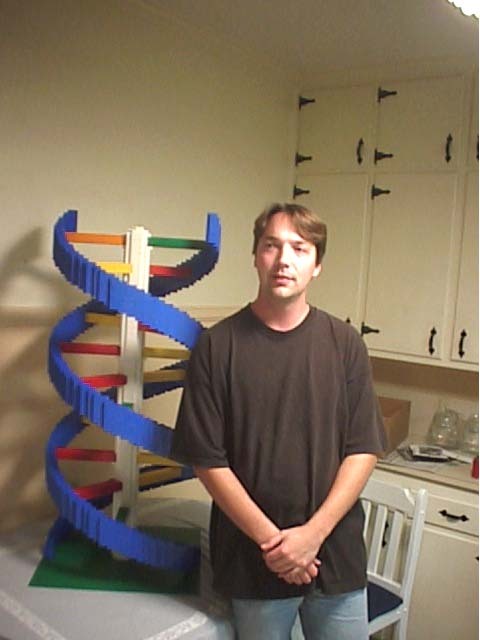 [Update, 13 July 2003: I have also, now, create a miniature DNA helix model]. Oh, and as a bonus: many people often email me asking for instructions for my models (they obviously have not read my FAQ). For this model I have something to show. The image below was all I used to create this model (I printed it out and scribbled some pencil lines on it at 5 degree angle partitions, but this was pretty much it). 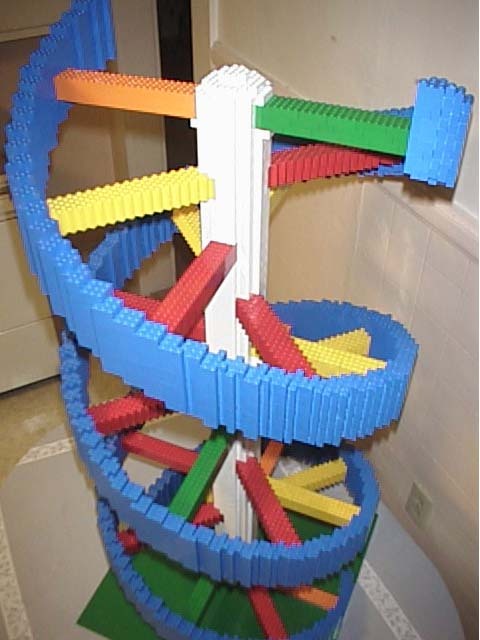 So, if this helps you out, and you want to built your very own LEGO DNA sculpture... I wish you well.